Nutrition » Fall for this gluten-free & dairy-free squash pasta! Fall for this gluten-free & dairy-free squash pasta! 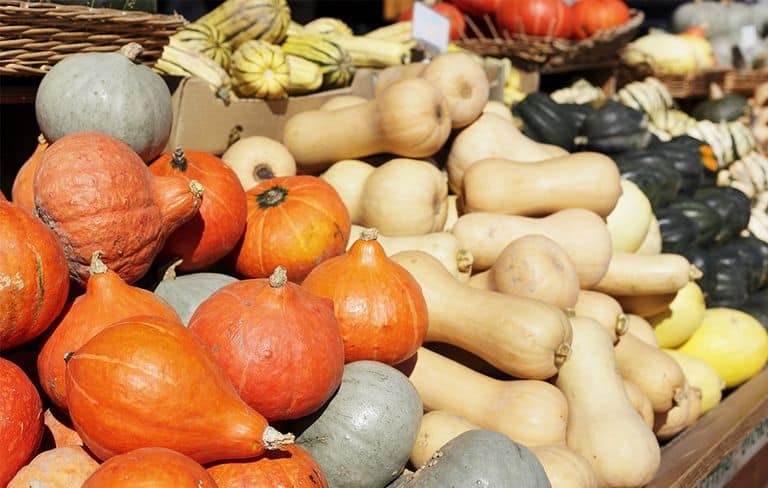 Fall is upon us and you know what that means…winter squash is abundant! And what better way to spruce up a pasta than with squash? Don’t you love an el dente pasta with a creamy sauce? Well guess what? This dish has all the pasta-ness that you love as well as the creaminess yet it’s gluten-free and dairy-free. All you do is switch out regular durum wheat pasta with brown rice pasta and leave out the cream because the squash is creamy enough! Cover a large pot with about an inch of water and bring to a boil. Add the squash in and cover with a lid. Let cook for about five minutes, stirring occasionally. In the meantime, boil the pasta water and once it’s boiling add the entire packet/box of brown rice pasta and cook for the duration listed on the packaging. Remove the lid from the squash pot/pan and stir the squash cubes. Once the water has boiled away and the squash is firm to the touch add a dollop of butter or ghee or a tablespoon of olive oil or coconut oil. Throw in your sage (about a tablespoon) or other herbs and lightly stir so that the herbs cover all the squash cubes. Once the pasta is ready, remove from the stove and drain the water. Remove the squash from the stove and scoop them into the pasta and lightly stir. FYI some people totally ignore squash in the grocery produce section because they think of squash as a starchy high-carb veg but truth be told squash, which is actually technically a fruit, has an amazing amount of vitamins and minerals including carotenoids, which is what give it its bright orange color and have amazing anti-oxidant properties. Most winter squash have 12 different carotenoids including beta-carotene, which gets converted in the body to Vitamin A, which is why winter squash has a whopping 60% of this vitamin. Squash also has 26% Vitamin C; 21% fiber; Vitamin B6; manganese; copper; Vitamin B2 and B3; folate; pantothenic acid; Vitamin K; potassium and magnesium! Who knew, right? Just remember that the name ‘winter’ squash isn’t entirely accurate because it’s not grown, harvested or eaten only in the winter. But it does have a very long growing season of 90-120 days. So even if it’s planted in the spring, it won’t get harvested until the fall. An amazing thing about winter squash too is that because of its hard, protective skins, these squash can store in your home in a cool place for many months before you eat them. Another amazing thing about squash is its seeds, which contain high amounts of Vitamin E and make an amazing, healthy snack. Once you’ve scooped them out of the squash, washed and dried them with a paper towel, you can spread them onto a baking sheet and drizzle with olive oil or coconut oil and salt and roast on 300 degrees for about 20 minutes. Yum!